Employees in many industries are protected from possible hazards by wearing high-visibility clothing during their activities. One important example is people working on roads or railway tracks. However, during the work, the high-visibility clothing can become contaminated by, for example bitumen, tar or buffer grease. This contamination reduces the warning effect of the high-visibility clothing. The safety-relevant areas with sufficient visibility of the background material as well as the reflective stripes are reduced in size. This fact may represent a significant safety risk for the employee wearing such clothing. In order to ensure that high-visibility clothing maintains its protective function throughout its service life, cleaning methods are required specifically designed to particular products and applications. In particular, contaminations have to be removed, while the textiles are treated as gently as possible. Currently, no reference processes are available and each textile services provider has to separately determine suitable cleaning conditions. Cleaning processes currently in use lack the ability to efficiently remove contaminations such as bitumen, tar or buffer grease. Only by application of large amounts of chemicals and washing times, these contaminations can be removed. This intense washing procedure causes damage to the materials and reduces the number of cycle times regarding the leasing of high-visibility clothes. New procedures should allow high-visibility clothing to go through more than 25 cleaning cycles. 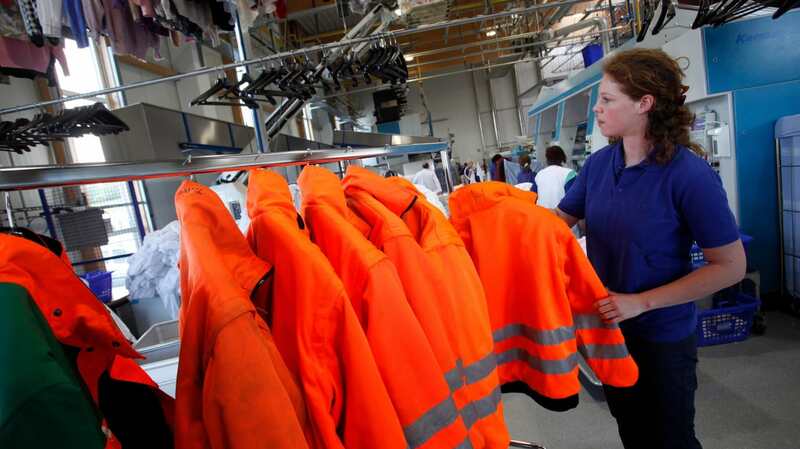 On average, statistics from textile services providers show that high-visibility clothing has to be withdrawn usually after only 20 cleaning cycles. However, an economically suitable leasing price depends on an average service life of about 25 cycles. Reference cleaning processes for high-visibility clothing might provide guidelines to adapt practical procedures at individual companies. Developing validated cleaning procedures of laundries and textile leasing companies may base on the use of this reference process. Furthermore, there is currently no matrix for evaluating the available parameters that enables laundries to gain an overall view for choosing the most economically efficient cleaning parameters. Use of resources, care for materials and preservation of the protective function are key criteria that have to be considered during decision making. The current research project at the Hohenstein Group focuses on product- and application-specific reference cleaning processes for high-visibility clothing. These washing processes are designed to be gentle to textiles, while removing persistent contaminations such as bitumen from the high-visibility clothing. Laundries will be able to use the results as basic principles and apply them to their individual work in practice. One key point is to improve the dissolving, emulsification or suspension of oily or greasy contaminations during the washing procedure, because they particularly reduce the service life of high-visibility clothing. Due to their increased capability of solving persistent contaminations at low temperatures, microemulsions and soil release polymers were selected as two approaches in developing novel reference cleaning processes. Necessary data will be recorded and entered into an evaluation matrix (including retroreflection, weatherproof properties and water and energy consumption) to enable an easy transfer from laboratory to industrial scale. For manufacturers of high-visibility clothing, textile service providers and certification authorities, such an evaluation matrix is a key requirement for integrating the results into their processes. The reference cleaning process as well as the evaluation matrix allow for the assessment of the entire cleaning procedures including optimisation of parameters at individual businesses. Adaption of parameters in laundries and textile leasing companies will minimise the probability of a premature loss of functionality of the high-visibility clothing. Additionally, results of individual parameter changes can be estimated by use of the developed evaluation matrix. Therefore, Textile leasing companies will have a reliable basis for calculating the expected service life of high-visibility clothing. IGF project 19301 N under the auspices of the Research Association Forschungskuratorium Textil e.V., Reinhardtstraße 12-14 10117 Berlin, was sponsored via the AIF as part of the programme to support "Industrial Community Research and Development" (IGF), with funds from the Federal Ministry of Economics and Energy (BMWi) following an Order by the German Federal Parliament.